How to easily format and partition a USB flash drive? The formatting and partitioning process in Ubuntu MATE is not as smooth as I had hoped and I frequently run into problems. (First) I still don't understand why I am asked to select a particular partitioning option when formatting a USB flash drive, only to be required shortly afterwards to partition it again (otherwise Caja won't detect the device). Why mislead a user into believing that it will be formatted and partitioned in one step when in fact I have to partition it anyway after it is formatted? Is there any way to do this more elegantly? I am not sure what it means, so I formatted again (this time I used the quick format option in Disks). Before I get any further error messages, I am wondering whether I have chosen the wrong partitioning option. Which option shall I choose and why (for later use as a bootable USB drive)? (Third) Is there anything I need to consider when I intend to use a USB flash drive for storing documents or in order to make it bootable by burning an ISO file onto it? Does anyone know how I can numerate my questions/problems in this thread? In the editing view I see it as 1. 2. 3. In the viewing pane and the published thread there is no enumeration. if you want just a normal bootable USB, just pre-format the stick to FAT32 first with Gparted!. The latter being newer (less limitations) and supports > 2 TB. For a flash drive, MBR is sufficient. I’ve known Disks to just spew out random errors sometimes. Usually it worked, re-opening Disks shows the results or just doing the operation again does the trick. Is there anything I need to consider when I intend to use a USB flash drive for storing documents or in order to make it bootable by burning an ISO file onto it? For storing files, it’s best to use FAT. For creating a bootable USB from an ISO or IMG, the “Restore Disk Image…” button is used instead. If you mean creating a “persistence” flash drive (stores data across live sessions), the tool used to create it is responsible for that. Does anyone know how I can numerate my questions/problems in this thread? I am still not sure why the Format Disk option suggests Erase and Partitioning when in fact the only thing it does it formatting. When I select MBR and then start the process I end up having a formatted but not a partitioned USB drive. This is extremely confusing. Is the above what you are trying to achieve?. My problems with formatting and partitioning are much more basic. 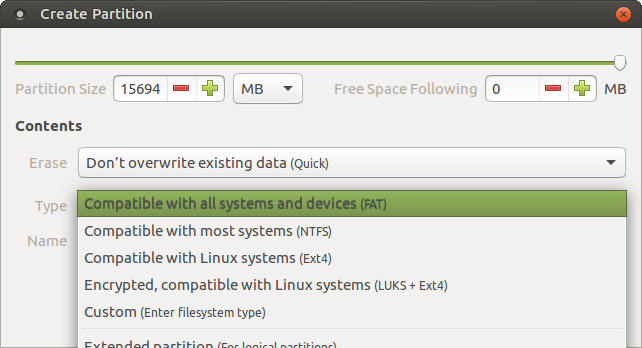 It is a pity that there is no program to easily format and partition a USB drive on Ubuntu MATE. The question about a possible fork of USB Image Writer and USB Formatter was raised some time ago but unfortunately not pursued any further. Disks is not intuitive at all. There are too many options without any explanation of what to use and why. I am hoping for a program which asks what you would like to do and does it with one click. The lack of an intuitive formatting and partitioning tool is one of the biggest drawbacks in UM for me. I know there is a learning curve when dealing with a new operating system but it is not too much to ask to get things done in a simple and intuitive way. Does anyone know how other distros solve this problem?